Using Microcarriers to Speed-up Your Scale-up. This presentation describes critical factors for selecting microcarriers, as well as starting protocols to help you optimize the attachment and expansion of cells in spinner flask and bioreactor environments. In addition, you’ll learn about new dissolvable microcarrier technology, which provides unique advantages for cells that cannot be easily separated from standard microcarriers. 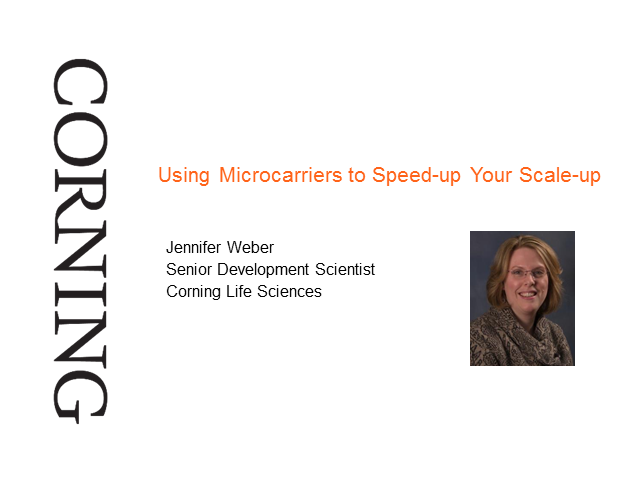 Jennifer Weber is a senior development scientist with Corning Life Sciences. She has helped develop a variety of products for culturing advanced cell types including Corning® Synthemax™, a synthetic, xeno-free surface, and Corning stemgro ® hMSC, a serum-free, chemically defined medium for hMSC culture. She recently transitioned to microcarrier product development and customer support for bioprocess applications. As part of this role, she facilitates customer adoption of Corning products for specific applications through protocol development, on-site technical support, and in-house customer-driven projects. All cell culture laboratories have experienced it: cell culture contamination and its inevitable loss of material. Contaminants may be biological or chemical, visible or invisible, destructive or seemingly benign, but in all cases, they adversely affect both the use of your cell cultures and the quality of your research. Identification and, even better, prevention of contamination are crucial for ensuring high-quality research. This expert webinar will present an overview on how to prevent, recognize and tackle contamination by introducing good lab practices and targeted interventions. If you work with cell culture daily or are interested in setting up prevention strategies to minimize contamination, then join SelectScience and Franziska Wienholz, scientific support specialist of Corning Life Sciences, for this educational masterclass. Franziska will share a 10-point plan to prevent contamination and provide a comprehensive refresher on all aspects of cell culture. Dr. Richard E. Eglen, Vice President and General Manager, Corning Life Sciences. Advances in three-dimensional Cell Culture in Drug Research, Discovery and Biologic Manufacture. Cellular research is optimal when using physiologically relevant cell phenotypes and genotypes of human origin. This assertion has accelerated the adoption of primary cells, stem cells, and, increasingly, patient-specific cells in drug discovery. Over the past five years, technological improvements in 3D cell culture technology, to better mimic in vivo physiology, have also advanced. This is true not only in the areas of cancer and neurological research, but also in the assessment of clinical candidates for metabolic and toxicological liabilities. Furthermore, 3D cell culture is facilitating novel approaches to both the scale-up and manufacture of biologics, including those used in immuno- and stem cell-based therapies. Are you a scientist interested in 3D cell culture? Join this expert webinar, in which Dr. Richard Eglen will discuss the importance of 3D cell culture in drug discovery and manufacture and how technological improvements are causing significant advancements in this field. - The impacts of 3D cell culture on drug discovery and manufacture, particularly in the context of using phenotypically relevant cells? - The potential for spheroids, organoids, scaffolds, and hydrogels in cellular research and compound identification, screening, and development? Harvesting your cells is an important step in maintaining healthy cultures. Good technique will lead to a healthy single cell suspension. There are many harvesting options depending on the cell line and application. In this video, we will discuss some tips/tricks to harvesting cells. Looking for tips using Matrigel matrix before you coat and plate your cells? We’ve got you covered. Watch our short tutorial for best practices on how to coat Matrigel Matrix as a thin gel layer. Trying to use Matrigel matrix for cell attachment? Watch our short video to learn the best way to coat Matrigel matrix in a thin, non-gelled protein layer. Did you know that cells can be cultured inside Matrigel matrix? Learn more about the “thick-coating” method to embed cells in a 3D, more in vivo-like environment. Tom Villani, Ph.D., Ann Rossi, Ph.D.
One of the obstacles to working with 3D cell cultures is how to extract meaningful data from them. To address this problem, Visikol has developed their Visikol® HISTO-M™ tissue clearing reagent that allows for complete 3D cell culture characterization using confocal imaging or a 3-fold increase in cells detected using wide-field microscopy. This tissue clearing approach has been developed to be rapid and compatible with multi-well plates so that it can be conducted using automated pipetting robots and high content confocal imaging systems. Dr. Tom Villani is the CSO and Co-founder of Visikol Inc and is responsible for the companies scientific strategy. Since launching Visikol with Co-Founders Dr. Michael Johnson and Nick Crider, Dr. Villani has led the development of the Visikol HISTO tissue clearing technology for three-dimensional tissue imaging as well as a suite of digital pathology tools. Visikol has leveraged these technologies in its 3Screen service offering where the company is focused on transforming tissues into actionable insights as a service for primarily pharmaceutical companies. Dr. Ann Rossi graduated from the University of Rochester School of Medicine and Dentistry with a Ph.D. in Pharmacology and received postdoctoral training at the University of Chicago. Prior to joining Corning, Ann worked as a Senior Scientist at ARMGO Pharma, Inc., a small private pharmaceutical company, contributing her expertise in calcium signaling toward developing new assays for the company’s screening cascade. Ann is new to Corning Life Sciences as the Applications Lab Manager in Kennebunk, Maine and is drawing on her strong academic and industry research experience to direct the activities of the applications group. With more than 1 million deaths worldwide per year, lung cancer remains an area of unmet needs. Realistic human 3D models are required to improve preclinical predictivity. To that end, OncoTheis has engineered a novel in vitro lung cancer model, OncoCilAir™, which combines a functional reconstituted human airway epithelium, human lung fibroblasts and lung adenocarcinoma cell lines. Because of its unique lifespan (>3 month) and its dual composition (healthy and cancerous human tissues), OncoCilAir™ allows for the concurrent testing of the efficacy of drug candidates against malignant cells and their non-toxicity against healthy tissues. Accordingly, a first proof of concept study performed on a panel of anti-cancer drugs including the investigational drugs selumetinib and Mekinist® demonstrated that OncoCilAir™ carrying the KRASG12S mutation showed responsiveness in agreement with first clinical reported results, validating this unique tissue model as a predictive tool for anticancer drug efficacy evaluation. OncoTheis has now extended the model to EGFR mutations. Results showed that OncoCilAir™ EGFRdel19 is sensitive to Tarceva® and Iressa® treatments and provides a useful model to decipher in vitro mechanisms of resistance. We hope you join us for this special webinar. Jeff Irelan, Director of Scientific Applications for Organovo will be our guest presenter. Nonalcoholic fatty liver disease (NAFLD) is the most common liver disorder with an estimated prevalence of over 25% worldwide and is projected to become the leading indication for liver transplant by 2025. Despite decades of research focused on NAFLD, an effective treatment has yet to be approved. This is due in part to the reliance on cell culture and animal models that present challenges in translation due to limited functional longevity and species differences, respectively. •Nutrient overload leads to the accumulation of lipid droplets in hepatocytes. •Incorporation of Kupffer cells and stimulation induces inflammatory cytokine release. •Chronic exposure to nutrient overload leads to stellate cell activation and fibrosis. •Chronic exposure to chemical inducers of fibrosis or TGFβ stimulation leads to stellate cell activation and fibrosis. •A TGFβR1 kinase inhibitor effectively blocks TGFβ-induced fibrosis. Jeff Irelan holds a Ph.D. in molecular biology from the University of Oregon. As Director of Scientific Applications, Jeff interfaces with Organovo’s customers and R&D team to implement and expand the company’s portfolio of service offerings utilizing bioprinted tissue models. It is now recognized that target and compound identification, as well as validation, are better conducted using cells with physiologically relevant phenotypes and genotypes. This assertion has accelerated the adoption of primary cells, stem cells, or patient-specific cells in cellular research, in general; and drug discovery, in particular. Technological improvements in three-dimensional (3D) cell culture technology, as a means to better mimic in vivo physiology, have accelerated recently—not only in the areas of cancer and neurological research, but also for the assessment of compound metabolic and toxicological liabilities. Furthermore, 3D cell culture can provide novel approaches to the scale-up and manufacture of biologically based medicines, including those used in immuno-and stem cell-based therapies. In this presentation, the existing and future impact of 3D cell culture technology on fundamental research, and drug discovery and manufacture will be addressed, particularly in the context of using phenotypically relevant cells. Specifically, it will discuss the potential for spheroids, organoids, scaffolds, and hydrogels in cellular research and compound identification, screening, and development. Future directions will also be covered, including organs-on-chips, hydrostatic flow technologies, microfluidics, and 3D bioprinting. Some of these approaches will allow for real-time observation of cellular responsiveness to novel compounds and drugs … boldly taking the researcher into a fourth dimension of 3D cell culture! Chimeric antigen receptor (CAR)-T cells, which are engineered to recognize target cell surface antigens expressed on tumor cells, have shown promise to affect complete remission in patients with B-cell malignancies. However, applying this approach to target solid tumors has resulted in adverse effects in clinical studies. Methods for testing different models of CAR-T cells in vitro can provide further insight into viable antigen targets. Historically, two-dimensional (2D) cell culture models have been used in drug discovery. However, more elaborate, three-dimensional (3D) cell culture models better mimic the in vivo tumor microenvironment and help bridge the gap between in vitro studies and clinical outcomes. In this special joint webinar, panelists from ProMab Biotechnologies, DiscoverX, and Corning Life Sciences will present data on a high-throughput, easy-to-use, highly reproducible method for screening CAR-T cells in a 3D cell culture model by combining various technologies. Dr. Nitin Kulkarni is a member of the Scientific Support team at Corning Life Sciences. He has a Ph.D. in Biology and has worked on engineering transgenic mouse models for autoimmune diseases during his post-doctoral research at the Beth Israel Deaconess Medical Center in Boston, MA. In his current role, he supports researchers with applications related to cell culture including advanced surfaces and extracellular matrices, genomics, drug discovery and bioprocesses. Three-dimensional cell cultures, and multicellular tumor spheroids in (MCTS) in particular, have recently become a widely used tool for preclinical anticancer drug testing in high-throughput screening (HTS) setup. However, even though MCTS have been applied for HTS, their use has been limited to simple assays, such as assessing cell viability or inhibition of growth. This webinar will cover new approaches to MCTS-based HTS. It will present a new, robust viability assay, well-suited for HTS and based on green fluorescent protein (GFP) used as a surrogate marker of spheroid viability. It will also review a first-ever approach to obtain information-rich transcriptomic data from drug-treated MCTS on a large scale. In addition, the presenter will demonstrate how this novel platform resulted in the identification of previously unrecognized, context-dependent drug responses of cancer cells and in findings with potential clinical relevance. In summary, this webinar will demonstrate new ways of how MCTS-based HTS can be used to provide unique insights into context-dependent biology and cellular drug responses. Wojciech Senkowski will soon complete his Ph.D. in Medical Sciences at Uppsala University, Sweden. In his work, he looks for applications of various tumor spheroid models in high throughput drug screening. For his work, Wojciech has received the AACR Scholar-in-Training Award. He was also a presenter and expert panelist at the Genetic Engineering & Biotechnology News webinar on 3D cell cultures, sponsored by Corning in February of 2016. The Corning Scientific Seminar Series is a series of free, online technical presentations that provide novel tips, best practices and proven techniques to help advance your research. Delivered by scientists to scientists, these one-hour broadcasts offer useful information and tips for lab technicians and researchers. Title: Using Microcarriers to Speed-up Your Scale-up.